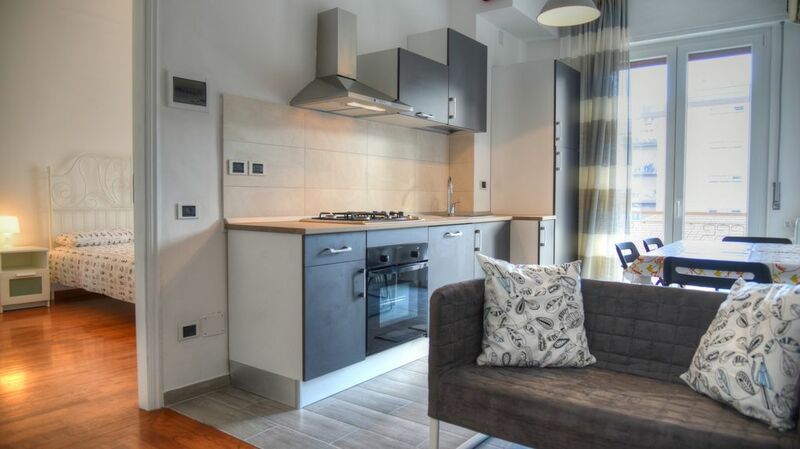 Very bright and recently renovated apartment. Very close both to the historic center - two steps - and to the beaches that are less than 700 meters away. In the area around the building there are free parking lots. The house consists of 2 large bedrooms (for a total of 4 beds), a bathroom with shower, a kitchen and a terrace. Free WI-FI and two TVs (one in the living room / kitchen and one in a bedroom), air conditioning, central heating but manageable independently in each room, dishwasher, washing machine, hairdryer, ironing board, clothesline. The terrace is equipped with sunshades. In less than 10 minutes walk along the tree-lined avenue you reach the beaches. The beautiful old town of Albenga, full of history and museums, is just steps away. The train station can be reached in less than 5 minutes on foot. The main bus stop is 200 meters away. The apartment is located on the third floor of an apartment building with a lift. The area around the building where the apartment is located has free parking (make sure the days of cleaning the streets that are indicated with appropriate signs on each street). The location is also very convenient to reach the beginning of the "Julia Augusta", the ancient Roman road that connects Albenga to Alassio, ideal for walking or mountain biking. Check-in and check-out can be changed if there are no other guests arriving or departing. For long stays, discounts are automatically applied. My son and I had a great holiday in Albenga, it's a lovely place with lots to see. The apartment is exactly as described in a fantastic location in the centre of town and close to the beach. It was very clean and well equipped. The bedrooms are spacious but there is no sitting room. I'm very happy you were fine in the apartment and hope you will came again. La proprietaria Serena è gentile e disponibile. Consigliatissimo!! Wir haben den einwöchigen Aufenthalt in Albenga sehr genossen. Der Kontakt mit der Vermieterin war bereits im Vorfeld sehr nett und unkompliziert, die Schlüsselübergabe perfekt. Vor Ort erhielten wir von der Vermieterin einen Stadtplan und Tipps bezüglich der Einkaufsmöglichkeiten und Ausflüge. Die Wohnung ist schön eingerichtet, sauber und hat eine angenehme Größe. Der Balkon lädt zum Verweilen ein. Auf unsere Nachricht, dass die Kaffeemaschine defekt sei, hat die Vermieterin sofort reagiert und noch am Sonntagabend (!) eine neue bereitgestellt. Wir haben uns in der Wohnung insgesamt sehr wohlgefühlt. Albenga hat eine wunderschöne Altstadt (Fußgängerzone), rundum allerdings auch viel Verkehr. In unmittelbarer Nähe der Unterkunft befinden sich zahlreiche Geschäfte und Restaurants; auch das Meer ist in kurzer Zeit zu Fuß erreichbar. Wer eine lebendige Stadt mit Urlaub am Meer verbinden möchte und nicht unbedingt besonders ruhebedürftig ist, wird sich in Albenga wohlfühlen. Thank you very much for this beautiful and detailed review. For what is in my possibility (for instance the coffee machine) I always try to do the maximum. I really hope to meet you again in the future! Vorrei ringrazia Serena, lei è stata molto gentile, venendoci ad accogliere in stazione ad un oraraio scomodo e rendendosi disponibile . La casa è molto bella, accogliente, completa davvero di tutto, dai detersivi, a ciò che serve in cucina, a campioni di articoli in cucina ed in bagno. Non mancano neppure dei libri in camera, cosa che ho molto apprezzato. A dieci minuti dal mare ed ancora meno dalla stazione. L'appartamento è vicino a supermercato e negozi, ed Il centro storico è bellissimo. L'unica pecca è che abbiamo trovato un mare un po' sporco. Aggiungo che trovo alte le spese di pulizie, in ogni caso, ci siamo trovati molto bene in casa. Sono molto contenta che vi siate trovati bene e che abbiate apprezzato le piccole accortezze che cerco sempre di non far mancare per far trascorrere un piacevole soggiorno nell'appartamento. Siamo stati benissimo! Non mancava niente. L’appartamento è ben attrezzato in una posizione fantastica; vicino al mare e al centro storico. Padrona di casa gentilissima. Albenga è stata una bella sorpresa con un sacco di iniziative! Soggiorno perfetto!! E' stato un vero piacere avere degli ospiti come voi e sono molto felice che vi siate trovati così bene nell'appartamento. Albenga is in a strategic position. If you want to stay in the city you have the opportunity to relax on the beach (on sunny days you can have lunch outdoors even in winter) and enjoy the sea, or visit a charming center full of history, with interesting museums to visit and bars and restaurants for your evenings. Also from Albenga begins the Roman road (passable only on foot or with mountain biking) that leads to Alassio offering breathtaking views. In addition, the whole area above the city is full of trails for lovers of nature walks and excursions. Alassio, famous for its beaches and shopping, is only 4 km away. For the younger ones less than 10 km there is the water park "Le Caravelle" and in Laigueglia there are inflatables on the sea ("WOW Park"). The Toirano caves are located about 20km away. There are many beautiful old villages that deserve a visit like Finalborgo, Borgio Verezzi, Cervo, Dolceacqua and Apricale. The French border is about an hour's drive away.